Fussy and Fancy Steampunk Challenge! when I heard this challenge, I felt out of my comfort zone. I hope that you like her! by my very talented DT Friends. Another Fresh Brewed Designs June digi release! coloring her in and creating with her. get a chance to pick her up. you are in for a huge treat! wanted to create with her! that you have a wonderful day! with the big eyes along with an adorable beach scene. my mothers pretty crocheted flowers! the edges and added some ink and paint! I wish I had more time to craft. I just love to play! Stampin Up gold and white thread onto. that you can see peeking out of the left corner. The lace, buttons, butterfly, shell and baubles are from my stash. I finished my card off with some white paint and sugar glitter. I hope that you can join in on the fun! from at the Fresh Brewed Designs shop. to catch up on while you drink your coffee or tea! Psst. I heard there is a big sale going on! enter my card into some more fun challenges! I hope that you have a wonderful and creative day! sunny day at the beach! my mother. I added some fun buttons as flower centers. I think that the corner life preserver ring is Jolee also. I hope that you enjoy a wonderful day! option of making a Box Card! This adorable little fairy image is colored with copics. The cardstock and DP is Stampin Up and the lace is from my stash. I had so much fun creating this fun project! because I had more time to plan what I wanted to do! You can find the Box Card tutorial that I used here. fabulous new Digi Design Team? Fresh Brewed Designs June Monday Digi release! I hope that all of you enjoyed a great weekend! We certainly had some hot and humid weather around here! It was time to fill the kiddie pools up and get wet! Today is the first Monday in the month of June! 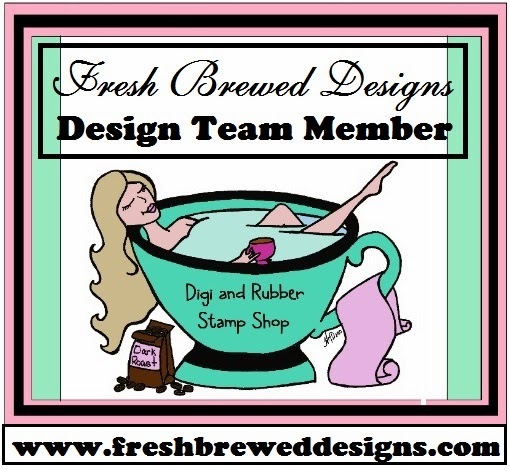 at Fresh Brewed Designs this month! for the month of June! and finally, I want to thank my very sweet and thoughtful mom! a surprise package with lots of other pretty flowers to use! The cloud is actually cut out of a piece of lace from my mother too! her husband, Bob, and Surfing Starfish! huge smile to your face! with Heather's newest super fun summer digi's!